No results found for this request. HOW DO I GET A REFUND OF VAT WITH TAXFREE4U? VAT — “Value Added Tax”. The implicit tax imposed on sold items included into the established price. The VAT percentage value is different for each country. Each traveler who buys goods for personal use only, and exports them to the non-EU countries, is entitled to the tax free shopping and receiving the VAT refund. How do you know which shop you can claim VAT from? 99% of all stores (retailers) can claim VAT and provide receipts with included line: VAT equals 20% that`s the point. When you are making a purchase in a small store, please clarify whether you can claim vat from it? You do not need to look for a logo of Tax refund company in the window of a store. We are cooperating with all shops which claim VAT. What documents are required to be submitted to use the TaxFree4U service? If you use our service for the first time, you need to upload a colored copy of the 1st page of your foreign passport in a two-page spread. After making a purchase, you need to upload a photo of standard receipts for the purchased goods. Besides, by the personal request of the manager of the TaxFree4U Customer support team, it is required to submit a colored photo or colored scan copy of the page of your foreign passport containing Visa that grants you permission to enter and stay in the European Union. Photo of the Visa is requested by the TaxFree4U Customer support team when VAT form is sent to you, and you should send it to the e-mail: support@taxfree4u.eu. What are the requirements of TaxFree4U to the photocopy of the passport? You should upload the colored copy or a colored scan copy of the 1st page of the passport in the two-pages spread via the mobile app or when signing up at the website. In exceptional circumstances, the passport photo can be sent via e-mail to the TaxFree4U Customer support manager (support@taxfree4u.eu).To create a copy of the passport you can use the camera of your mobile phone. Open the 1st page of your passport take a picture of it in the two-pages spread. Check the received image. It should not contain any indistinct areas and text should be readable. The passport photo should be horizontal oriented and made not more than 3 months prior to the registration in the TaxFree4U system. When attaching the document you should consider that, a low-quality copy of the passport will prevent you from completing the registration in the TaxFree4U system and from start using our service! Your registration request will be sent for revision until you upload a good-quality image. Of what type should receipts be to ensure use of the TaxFree4U service? You should upload receipts at the business time on the day of purchase! One receipt – one photo. 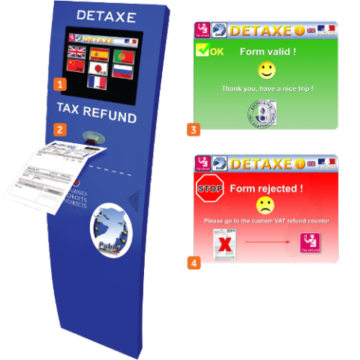 In which countries can I refund the VAT via the TaxFree4U service? In the offing you will get a possibility to enjoy advantages of shopping with TaxFree4U in a wider range of countries. What are the rules of the tax free shopping in the European Union? What are the advantages of the TaxFree4U compared to other tax free refund operators? Does tax free shopping apply to the services (accommodation, bills from the restaurants etc.)? No. Although the tax is imposed on services, VAT refund is not applicable for them. Refund of business taxes is performed by other companies, allowing to claim the tax refund for car rent, restaurants, and hotel bills etc. Does the TaxFree4U service apply to the goods that are sent by mail, via courier delivery service or bought via the Internet? The TaxFree4U service applies only to the goods that were bought in the stores. All goods should be exported in the hand luggage only, should contain labels and price tags, and should be unused and/or in the original package. Can I use the purchased goods before exporting them? The purchased goods should be shown at the customs in the original package, should contain labels and price tags, should be unused and/or in the original package. Otherwise, customs officers can refuse to stamp your VAT form (export declaration). How do I fill the VAT form (export declaration)? This is a one-of-a-kind service provided by our company: we fill the VAT form (export declaration) for you! You will need to only to take pictures and upload your receipts from the store via the mobile TaxFree4U app. How do I get export validation of the purchased goods? in this case, an additional approach to the customs service window is not necessary. Please arrive in advance of departure to complete the confirmation process from the customs service. If I am departing from the European Union through the other member-state of the European Union (connecting/transit flight)? How do I get the VAT refund if I did not manage to obtain the export validation of the VAT form (export declaration)? How can I calculate the VAT refund amount? What is the VAT refund amount of the TaxFree4U service? Using the services of our service, you can refund up to 19% from your receipt amount! The refund amount depends on the sum of your purchase and the country where the purchase was made. You can calculate it using a calculator of the VAT refund on our website. I want to get a refund to my bank card. Should it be the bank card that I used to pay for the purchases? You can get the VAT refund amount on any other card. To get a refund on the bank card, specify its number in the mobile app or in the user area at www.taxfree4u.eu. Which documents should I submit to the TaxFree4U and how will I get the VAT refund? Where to send receipts and declarations originals? Send the documents upon your arrival to the country of residence. Documents are delivered at the expense of TaxFree4U. If you arrive at the Boryspil International Airport, you can leave the documents in the box near the Departure Check-in Desk №48. If it is more convenient for you to use the services of mail, send documents through any branch of “Nova Poshta” to our name: TaxFree4U, Kyiv, № 58. It is necessary to specify phone number recipient +38 063 48 57 530. After arrival to your home country, please, contact customer support team for the organization of courier delivery of documents to our office. Documents are delivered at the expense of TaxFree4U. If you have any questions, please call / write to customs support service. When will I get my VAT refund? up to 90 days for refunds that are made on other bank cards. How can I contact TaxFree4U, if I have any additional questions? What does TaxFree4U do with the personal data I submit to it? All client details are kept secure from any unauthorized usage. Passport details, as well as card details, and images/copies of the documents shall never be submitted to any third parties, and they are used only to confirm the identity of the applying Client. How can I pay for the purchases made in the European Union? You can pay for your purchases both in cash and non-cash resources (by paying with a bank card). Does TaxFree4U take any service fees? Yes, TaxFree4U withholds fees for processing each VAT form. The refunded amount equals the full amount of the VAT paid minus the VAT form processing fee. I want to get the refund on a credit card. In which currency will I get the refund? TaxFree4U supports the following systems – MasterCard, Visa.When transferring refund on credit cards MasterCard and Visa, the refund will be enrolled in the currency of your credit card or in the currency of the country in which it was issued.In the case of the refund in the currency that differs from the currency of the completed VAT form, the selling rate of the reputable European bank for retail banking applies plus FX commission. Why my refund was charged with the FX commission? In the case of the non-cash refund in the currency that differs from the currency of the completed VAT form, the selling rate of the reputable European bank for retail banking applies plus FX commission. Can I change the method of getting the VAT refund? Yes. Contact the TaxFree4U Customer support team that will assist you in choosing the most convenient method of getting the VAT refund. What is the export validation of the goods? Export validation is the process of getting a stamp on your document package (VAT form and invoice) at the customs office in the check-in area/airside zone of the airport, or from an authorized company, or in the E-terminal. Export validation is made in the final check-point at the departure airport from the European Union.For example, if the traveler flies en to route London – Milano – Riyadh, the validation procedure (check-out and getting stamps on the VAT form) should be taken by the customer in Milano at the Customs Office. What should you have for export validation of goods? What if the good, you need to get the export validation for, should be declared and transferred to luggage? If your goods are to be transferred into luggage, when checking-in, please, inform the manager at the airport about such goods, export of which needs to be validated (declared at the export customs). Let him know that that it will be required to place it later in the luggage, and take a special label/tag. Upon check out by the customs officer of the documents and the goods, pass them to the customs officer to be sent for boarding. Why shouldn’t you take the form of another TaxFree operator in a store? If in the store you were given the form of another TaxFree operator – the company TaxFree4U has the right to not return VAT to the client. The reason is : the tax service of a country you were doing shopping will refuse to refund VAT due to a suspicion of attempting to double VAT refund over several operators. Ask the store to provide a standard check. VAT refund is paid for goods exported in the personal luggage of the traveler. Exported purchases should be in the original packages and unused. The maximum amount of exported goods of one type is 50 items. If you see a red screen, follow the instructions and go to the customs. Randomly customs officials can check your rights to have a refund of VAT. You must provide some documents that proof your permanent residence is outside the European Union, your valid ticket and goods subject to reimbursement. If you refuse to provide any document from the list – it may lead to the cancellation of the form of Tax Free and a fine. The customs officer is entitled to request to show him goods at his own discretion. Check in for the flight and go through the Customs. Be advised to submit the documents package: printed out VAT form with the invoice, passport, air ticket, packed goods, unused (upon request of the customs officer). proceed to the departure zone. Please make an attention: from November 01. 2017 our service suspended the work with few shops in France: Louis Vuitton, Chanel, Hermes. The VAT refund is paid for the goods that are exported in the personal luggage of the traveler. Exported purchases are required to be in the original package and unused. check in for the flight and go to the Customs office. Submit the documents package to the Customs officer: printed out VAT form and the invoice, passport, air ticket, goods in the original packages, unused (upon request of the Customs officer). If there is no Customs officer at the Customs VAT Office please contact the attendant officer via the phone located near the office, and inform about your presence. Who is eligible for the tax free shopping? receipt/invoice or the copy of receipt/invoice should be attached to the VAT form if purchase amount exceeds 20 000 EUR. Receipt/invoice number should be written on the VAT form. When making purchases in stores “La Perla” (Italy), at the time of purchase, you must inform that you need an invoice at the name of the company Brand4U Italy. Customs officer puts goods export confirmation in Otello system records. Check in for your flight and get to the departure zone. Get to the departure zone. 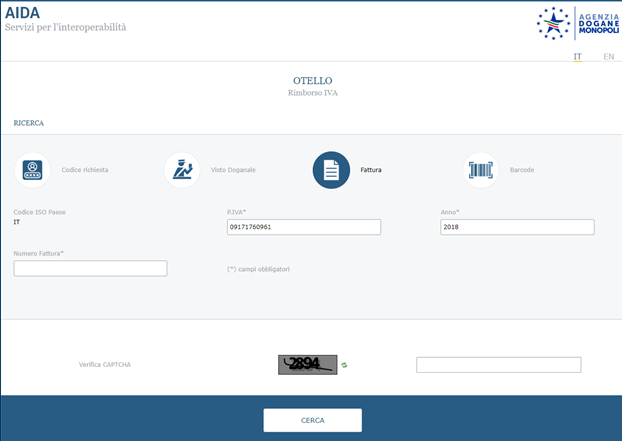 To check your declarations status, follow the link https://www.adm.gov.it/portale/web/aida-servizi/otello choose the box “Fattura” and fill in the appropriate fields with data for verification. You can change website interface language to English. 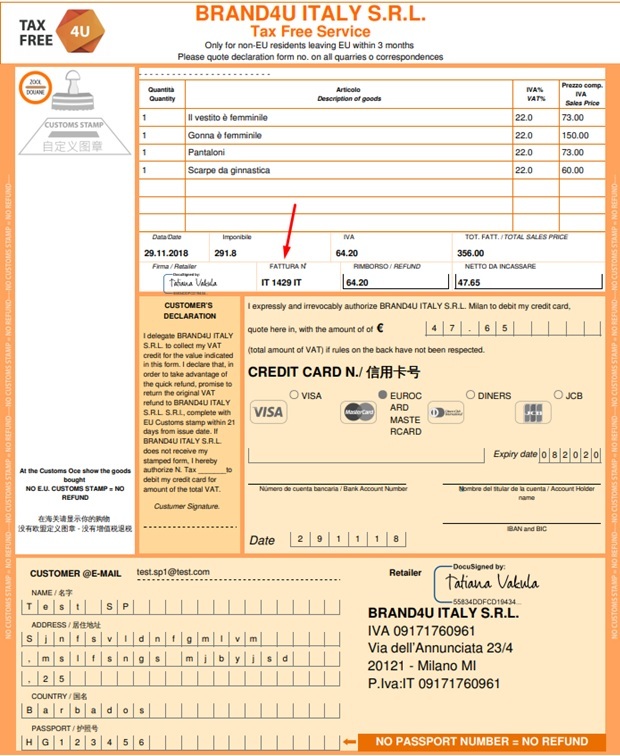 The field “Numero Fattura” – invoice number indicated in your declaration (no gaps between the symbols). Fill in the verification box CAPTCHA and press the button CERCA. We inform you that from November 01, 2017 checks issued by cash registers in the Italian trade network must be download to the mobile application at business time in the day of purchase. The company reserves the right not to include checks that is not upload in the declaration in the day of purchase. Submit the documents package to the Customs officer: printed out VAT form and the invoice, passport, air ticket, goods in the original packages, unused (upon request of the Customs officer). If there is no Customs officer at the Civil Guard Office please contact the attendant officer via the phone located near the office, and inform about your presence.